The compelling new Dr Temperance Brennan novel from the world-class forensic anthropologist and Number 1 bestselling author Kathy Reichs. 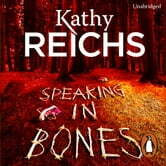 When forensic anthropologist Dr Tempe Brennan is approached by amateur detective Hazel ‘Lucky’ Strike, at first she is inclined to dismiss the woman’s claims that she’s matched a previously unidentified set of remains with a name. But as the words of a terrified young woman echo round her office from an audio recorder found near where the bones were discovered, something about the story won’t let Tempe go. As Tempe investigates further she finds herself involved in a case more complicated and horrifying than she could ever have imagined.